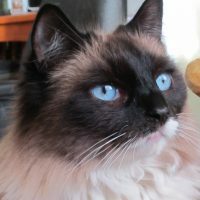 Note: If you like cats, you might be interested in my pattern for a cat mask. Your kids can wear it, or you can display it as a wall sculpture, like I do. The pattern creates all the shapes for you so it’s a fast, fun project. You can see it here. My cat is getting much closer to the day when I can start adding the paper mache. I really did think I could add the ears, toes and tail in this lesson, in addition to filling out the face, but the video would have taken way too long. Besides, it took me a long time to fill out the face, so I’m sure it will give everyone plenty to do before the next video. The cat looks really ratty at the moment with tape all over her, and things aren’t as smooth as I would like. 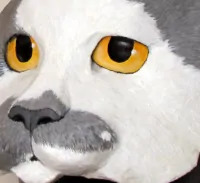 I tend to get a little sloppy with the armature ever since I developed the paper mache clay recipe – I know the clay will cover most of the bumps and smooth things out, while also making it easy to model the eyes and fur, so I don’t worry about it much. If you’re going to be using paper strips and paste instead, I’ll show you a trick or two for smoothing out the lumps when we get to that part of the project. By the way, Jessie was very brave this week, and put up her very first video, called “How Kids Change Art.” She still isn’t quite brave enough to let us see her in the video (I made dozens of videos before I allowed myself to actually “star” in any of them, so I know how she feels). I hope you’ll take a moment to go check it out, and give her a bit of encouragement so we can see some more videos from her in the future. And one last thing, which is sort of related to that last paragraph. I’ve been reading lately about creating a blog network. I confess that I still haven’t read that entire article to see exactly how it works, but I really like the idea of people with similar interests helping each other get traffic. Kind of like I just did when I pointed you to Jessie’s blog in the previous paragraph. If anyone is interested in helping me figure this system out, and if you’d like to help build the network, please let me know. I think it could be a challenging, yet interesting, project. You’ve been SO generous in sharing your skill Jonni – thanks for walking me through the process and demystifying it. THANK YOU! You’re welcome! Did you make a cat? If you did, do you have a photo you’d be willing to share, so we can see how it came out? I’m guessing my comment is a few years late. I used the paper mache clay recipe for this project. You didn’t mention how old your daughter is, so I’ll go ahead and mention that the recipe wasn’t really designed for little kids. It isn’t edible. That said, I use Elmer’s Glue-All in the recipe. You can see the full video (two of them, in fact) and the recipe, here. Since your daughter is helping, be sure to use mineral oil instead of the linseed oil I used when I first made the recipe, or don’t use any oil at all. The recipe works just fine without it. I hope you’ll let us see your daughter’s cat when it’s done. My daughter is 12. She doing an end of year art project, so I’m helping with the base for her. Except we’ve used tissue paper instead of newspaper. I’m in Australia, and we don’t have elders glue. So is that a white wood glue or a water based clear glue. Thanks. :-) and thank you for the reply. I didn’t see the dates on other comments til after I posted and thought I might be too late to ask. Oh, sorry – I gave a brand name when what you really needed was “PVA glue.” In the US, our PVA glue is called Elmers, but you can just go to the hardware store and ask for PVA glue and they’ll know what you mean. It’s a white glue. I hope your daughter’s project comes out just the way she wants it to. hi,what kind of joint compound do you buy? I buy anything that happens to be available, unless it was made by Dap. (Dap doesn’t work – it turns the clay into little rubber balls). You need to read the label of store brands, because some of them, like Bi-Mart’s joint compound, are made by Dap. It says on the back. I recently bought some no-brand joint compound at Wal-Mart, and it worked just fine. I was rushing because some children were coming for a couple of days and I thought it would be great to show them a little of the process – I just made the pattern, enlarged it a little, cut out the pieces (and jumped in not watching the next video about the styrofoam blocks!) anyway, it is in a half finished state right now and I am going to go back and correct my impulsiveness – the interesting thing was that every time the kids passed the table, even with just the cardboard armature and a little papier mache on it , they kept doing a double take and thought it was a cat. That was encouraging. Anyway, I am a painter and am thinking of doing some videos for instruction purposes. Could you tell me how you film yourself – are you a one-woman band or do you have someone videotaping you – what sort of camera are you using? Would love to give it a try and need some mentoring about setting up for an instruction video. Hi Su. What a nice story about the children’s reaction to the cat armature on your table. 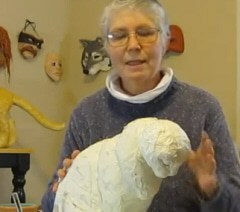 I’ve actually been having that reaction to my cat sculpture, too – but it didn’t start until I had started painting her. Now whenever I see the sculpture sitting on the table, I think it’s my real cat – even though I’ve just seen my real cat sleeping in another room. Yet that never happens when I see any of the other animals sitting around my studio. 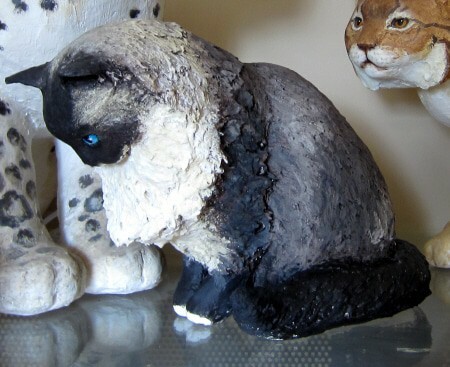 I don’t know why the cat sculpture “feels” like a real cat, when the others don’t. Is it because my unconscious brain knows there can’t possibly be a baby elephant in the house? I do hope you’ll show us your cat when it’s done. I take my videos with the video function on my Canon PowerShot Elph 300HS camera. The camera sits on a cheap tripod that has a quick release doohicky, so it’s easy to take it on and off. And the videos are edited in Vegas Movie Studio Platinum 9.0. (It looks like they have a much newer version). If I ever did a full-length how-to video to sell on Amazo.com (which a lot of people seem to think I should do, but I’m still not sure), I would buy a slightly fancier camera. And I know the lighting isn’t right, because I moved the furniture out of my living room so I could work in front of the south-facing window. That’s exactly wrong for video, because the light is sometimes too bright, sometimes too dark, and the camera gets confused. (I get confused a lot, too. 😉 ) So my next step is to buy some light stands and move the video operation to another room. The best videos about making how-to videos that I’ve found on YouTube are by Bill Myers. Gee, watching you do the face and then me trying it are world’s apart. The true sign of a master — making something difficult look so darn easy. I took a short hiatus from the cat after I ran into trouble with the head. While it looked “okay” to start, I wasn’t satisfied because it didn’t have enough of a cat look to it. So I added, and fiddled, and taped and it became a disaster. LOL! So as I felt my frustration rise I put it aside but haven’t picked it up again just yet. It’s laying on its side on my hutch staring at me now, so I may have to have at it again. I find though when I run into difficulties if I leave it alone for a bit and come back with a set of fresh eyes I can progress much better. At least that’s what I’m hoping. Oh, and great video on making the clay! There is a point in every project I do when I say “this can’t possibly work!” Sometimes that turns out to be true, but not usually. You might have better luck if you take all the paper off the face and start over – it would give you a fresh start. Also, I think I noticed that the head was slightly turned away in the photograph you used, so you might need to bring the face forward just a smidgen, or add just a bit of neck. Another fantastic tutorial, Jonni! And thank you so much for the link!! Everybody’s work looks great! I’m lagg’n I see. You all are putting me to shame. I’m just wrapping up some heads…El Lobo and my kitty cat. The plan was to make heads and if they look like the critters their supposed to be…I’ll attempt to add bodies. 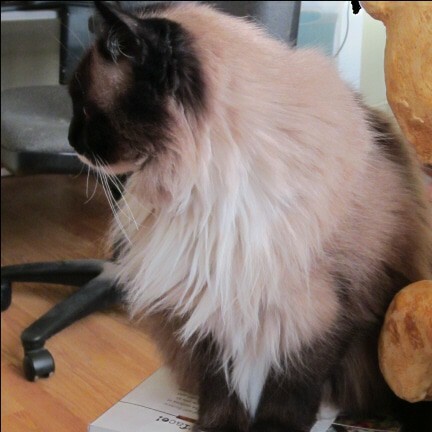 Debbie, looking at your bear gave me an idea. I might get things moving faster if I sculpt each body part separately then add them later, one at a time, and attach them together like a jig saw puzzle. Have you every tried that Jonni? I’m so slow, that might get my fire stoked. The bear and the cat are still needing attention before I put on the clay, but wanted to show you how far I am right now. Any imput would be appreciated. I am a first timer with this type of craft, But I am loving it! ok, hopefully I have all three pictures this time. I so don’t know what I’m doing. Thanks again. They’re all coming along really well. 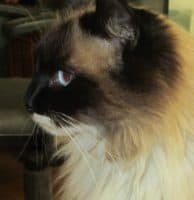 You’re getting a lot of movement and life in the four-legged creatures, and the muscles on the cat are nicely defined. I think you must know a lot more about it than you think you do. Hi Jonnie, I am having a great time with your lessons. I am uploading a pic of my deer trophy that I made. I am trying to get a pic of my bobcat uploaded. Having some trouble. I am following you on the cat lessons. Having a great time. I will keep trying to get my bear and bobcat on. Dont know what the problem is. Thanks for the lessons. You have taught me a lot! Debbie, I can’t see the images. Usually the problem is that the images were not made small enough in an image editing program. If they aren’t edited or saved for the web, the file size is too large and they won’t fit into the column. Then the upload program can’t work. Please try again – I’d love to see how the bear and bobcat are coming out. I wrote a response earlier…don’t know what happened to it. favorite subject). I also sculpt with polymer clay. I enjoy doing the elderly ladies. I am one that has too many interests and want to do them all. So I will sometimes switch around. I watched all your videos and can’t wait for the next one. I just finished my rabbits, as I was looking through your sculptures just now I saw your bunnies and I really liked the way yours turned out, nice job. You are so blessed with such a wonderful and talent and skills. listen to you. I so look forward to your updates. Thanks, Christine. I’m glad you’re enjoying the videos. Are you making a cat? Loving the videos Jonni, I agree with Lisa if you get any better, watch out Steven Speilberg, you will be producing block busters 🙂 . Very interested in how you are doing the face, I do mine very differently, ( which I will post pics) if it works out ok. Yes, do show us your method. Are you taking progress photos? Wow, Jonni, your videos are getting really sophisticated! Great job; very helpful. I enjoy watching to see how you do things, even though my style is not so realistic. I’d love to see some of your work. Do you have any images to share so we can see?